We Are: An open family of believers seeking to follow Jesus Christ and live out His teaching while we watch for His return. When I was thinking about what the Lord wanted me to share as Penny and I resume our roles here, one of the thoughts I had was to go through some texts that serve as the scriptural basis for that statement. Today’s text serves as a good scriptural basis for the idea of the local church being a family. The city of Ephesus was one of the major cities of the Roman empire in Paul’s time. He planted a group of churches there, and wanted to make sure that those churches stayed true to their identity as God’s family. Families do not just happen. Successful families take a lot of hard work. So, Paul spent several months there, teaching them from the word. After he left, he sent Timothy there, to continue establishing the church. Timothy had to train and appoint leaders who would also be responsible to equip the churches. 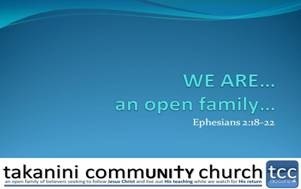 Paul’s letter to the Ephesians helped them to understand what it meant to be a family of believers. Being a family means sharing a relationship. I am not right now referring to a relationship with each other. That – I’ll talk about next. What I mean by relationship is that all the members of a church have the same Father. Verse 18 talks about the fact that believers have access to God the Father. Lots of families today are broken and blended, so it is not true that all families have an equal relationship with the same father. But we can all understand what Paul meant, because our church family exists because one God has called us all to himself. In the church, there are no stepfathers. The church never has a deadbeat dad. 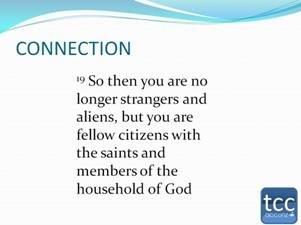 Each of as an individual is in the family of God because of God. He chose us, and adopted each of us into his royal family. We owe our identity not to something we did, or do, but to the choice of our loving Father to adopt us. Being in a relationship with God can change our attitude about life. It can take away old fears. Being in a relationship with God can also help us to endure the difficulties of our present lives, because we can see beyond them. Being a family means being connected to one another. Paul used words that described the connection that Jewish people in his day felt by virtue of their being both citizens of a nation, and members of a family at the same time. He implied that when people become part of the church, their status changes. Having just undergone a major ordeal in order to return to New Zealand, I can appreciate what a privilege it is to be reconnected. The Ephesians also got it. Most of them were Gentiles, and had not known any connection with the family of God. They had been considered outcasts. So, when they came to God through Christ, they had to learn about that new relationship. But they also had to learn what it meant to be part of this new family. · It meant bearing with each other in love (4:2); not insisting on my own way. · It meant being truthful with each other (4:25); not putting on a show. · It meant being kind, and forgiving each other (4:32); not making enemies. · It meant worshiping with each other (5:19); not insisting on my own preferences. · It meant submitting to each other (5:21); not establishing myself as the authority. Being a family means sharing a common purpose. One of the tricks to become mature as a family member is to stop thinking that everyone else in the family exists for your personal service and enjoyment. That is not how families work. 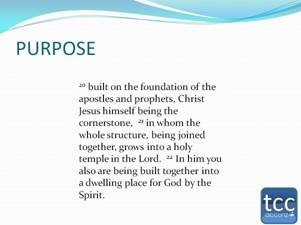 Paul uses the word picture of building to describe how the family of God exists for a purpose. He is also thinking in Hebrew, so he makes a kind of shift in discussion that seems weird. 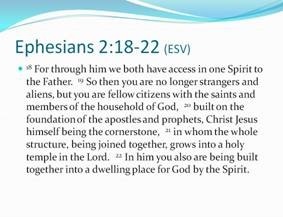 Notice that in verse 19 he was talking about being members of God’s household, but starting in verse 20 the metaphor shifts and he is talking about being built into God’s holy temple. No, this does not mean that Paul had lost his concentration. In Hebrew, the same word can be used for both a household and a temple. But another reason Paul shifted metaphors is that he was trying to convey a new reality about the church. The church consists of individual stones which are being fit together to become a holy temple. The purpose of the church today is that God is preparing to come back to earth and dwell upon it. We are being prepared today to be the eternal dwelling place of God. Now, you probably thought that God wanted you to live in heaven forever. No, he wants to live in us forever. It takes a little reorienting of our thinking to grasp the fact that God does not want to bring us to heaven. He wants to bring heaven to us, in the form of himself. This is the holy city that John saw in Revelation 21. It is God coming down to us, not us going up to him. The purpose for the church today is to prepare for that eternal reality. Christ himself is the cornerstone because when he walked among us he demonstrated what it means for God to be present among us. He set the pattern. The prophets and apostles are the foundation because the prophets predicted the coming of the church and the apostles planted it. Now, there is another very important word in this text that we cannot afford to overlook. It is the word together. God’s plan is not just to live in me, or you, but to live in us. We are the church together. Individually, we are members, but the members have to cooperate and be built together for the temple to function properly. 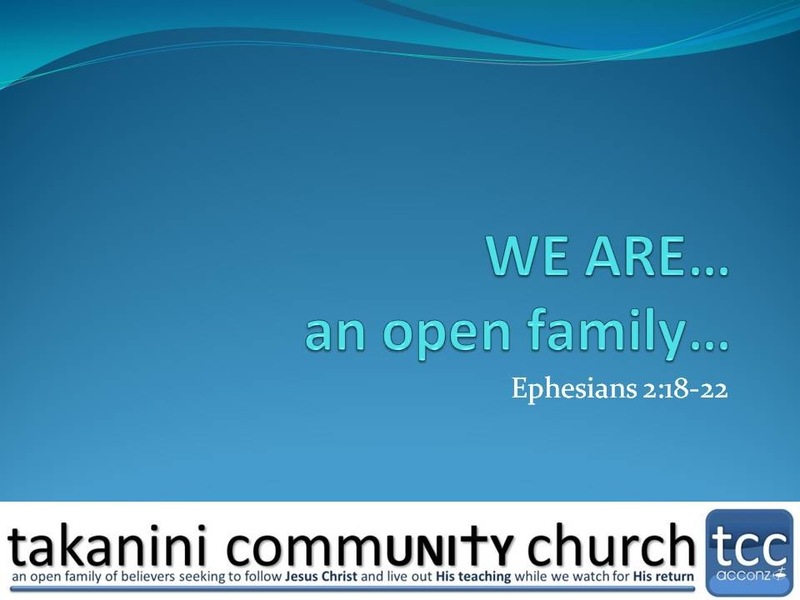 We, at Takanini call ourselves an open family. Anyone who wants to can join this family. You do not have to come from a certain race or ethnic group. You do not have to have the same social status. You do not have to be like the rest of us. But, as a member of our family you do have to have a relationship with our mutual Father. And, you will be expected to stay connected to the rest of us. And, you will have to want to make yourself fit for our purpose – to welcome and enjoy the presence of God for eternity. If that is your heart, welcome home. This entry was posted in sermon, sermon-archive and tagged Ephesians 2. Bookmark the permalink.